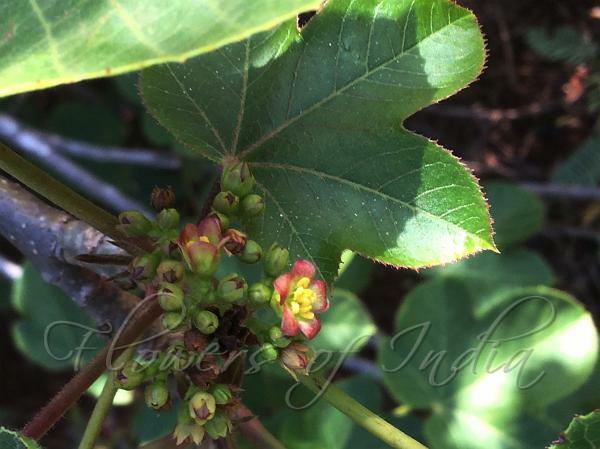 Tanjore Jatropha is a shrub up to 3 m tall with leaves alternate, shortly 5-lobed, 7.5-11 x 6.5-10 cm, thinly velvet-hairy along nerves. Leaf base is nearly heart-shaped, margin sawtoothed, serratures gland-tipped, tip pointed; leaf-stalk 6-10 cm; stipules fringed with hairs, glandular. Flowers are borne in cymes about 9 cm wide; bracts lanceshaped, 1 x 0.3 cm, or smaller in successive forkings; flower-stalk to 3 mm. Flowers are polygamous; bisexual flowers 9 mm across; male ones smaller, generally opening after bisexual flowers. Outer tepals pinkish-green, unequal, lanceshaped, 5-7 mm, sawtoothed, glandular, hairy, tapering; inner ones greenish yellow in bisexual flowers, pinkish in male, obovate, 5-7 mm, hairy within at base, decurrent, blunt. Stamens 8, free; filaments 3 mm; anthers 1 mm, bearded. Ovary 2.5 x 2 mm; styles 2 mm long. 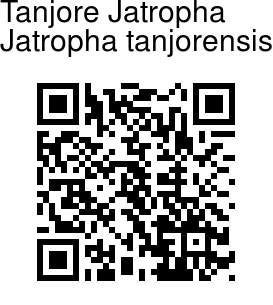 Tanjore Jatropha is found in Peninsular India and Africa. Flowering: November-December. Medicinal uses: IN Africa, Tanjore Jatropha is commonly called Hospital too far, Catholic vegetable, Iyana-ipaja, Lapalapa. Its primary use is for fencing while its secondary uses are as a source of edible leafy vegetables and medicine. It is useful in herbal medicine, prepared locally in most parts of Southern Nigeria by collecting the leaves and squeezing out the juice. Identification credit: S. Kasim Photographed at Karaikudi, Tamil Nadu.